Uncertainty is interwoven into human existence. It is a powerful incentive in the search for knowledge and an inherent component of scientific research. We have developed many ways of coping with uncertainty. We make promises, manage risks and make predictions to try to clear the mists and predict ahead. But the future is inherently uncertain - and the mist that shrouds our path an inherent part of our journey. The burning question is whether our societies can face up to uncertainty, learn to embrace it and whether we can open up to a constantly evolving future. In this new book, Helga Nowotny shows how research can thrive at the cusp of uncertainty. Science, she argues, can eventually transform uncertainty into certainty, but into certainty which remains always provisional. Uncertainty is never completely static. It is constantly evolving. It encompasses geological time scales and, at the level of human experience, split-second changes as cells divide. Life and death decisions are taken in the blink of the eye, while human interactions with the natural environment may reveal their impact over millennia. Uncertainty is cunning. It appears at unexpected moments, it shuns the straight line, takes the oblique route and sometimes the unexpected short-cut. As we acknowledge the cunning of uncertainty, its threats retreat. We accept that any scientific inquiry must produce results that are provisional and uncertain. This message is vital for politicians and policy-makers: do not be tempted by small, short-term, controllable gains to the exclusion of uncertain, high-gain opportunities. Wide-ranging in its use of examples and enriched by the author’s experience as President of the European Research Council, one of the world’s leading funding organisations for fundamental research. The Cunning of Uncertainty is a must-read for students and scholars of all disciplines, politicians, policy-makers and anyone concerned with the fundamental role of knowledge and science in our societies today. "This is the most insightful, thorough reflection I have ever read on the most fundamental issue of our world: how to accept uncertainty and how to deal with it. This book has extraordinary implications for the practice and epistemology of science. A seminal work that will influence science policy in significant ways." "With rapid advances in technology intersecting with human behaviour in unpredictable ways, how we approach issues surrounding uncertainty will inevitably impact every aspect of life. 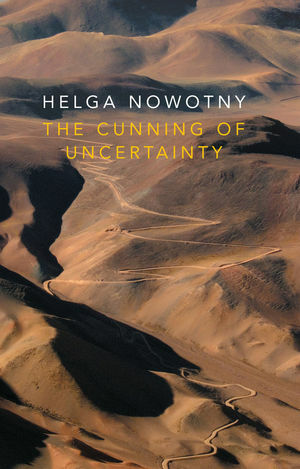 In this thought-provoking book, Professor Helga Nowotny brings unique perspectives on uncertainty from her extensive background as a scholar, policy maker and research administrator." "This brilliant new book confirms Helga Nowotny as the voice of social science in an initially unsympathetic milieu, and its intellectual champion in her insistence that without understandings of and through society, understandings of and through science cannot flourish." "From tea leaves to necromancy, from betting to scientific research, Helga Nowotny's exploration of uncertainty is deep and wide, playful and practical in turn. But at the heart of the matter lies a serious imperative, dear to my heart, which is the business of finding out about the world and how it works." "In this splendid book, Helga Nowotny tackles the ever-elusive human desire to tame the future by considering how technology and innovation feed imagination and aspirations. Millennial dreams, science fiction, sustainability studies, economics, algorithms and genetics are the stuff that drives her analysis across an amazing array of fields and situations. Despite unrelenting randomness, she advocates that we embrace uncertainty, for this is essential for developing capabilities and social resilience." "Nowotny's slim book is a big well of wisdom. You may find your sense of wonder refreshed if you locked in some time to drink deep from it." "Highly recommended to anybody with an interest in how humans fear, hope, and act upon the future."